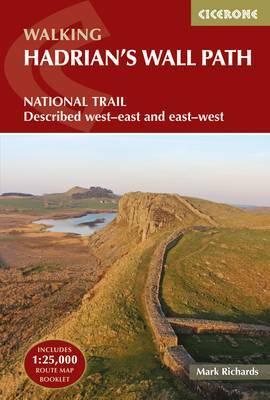 Hadrian's Wall Path - 3rd ed. Mark Richard’s Cicerone guide to Hadrian’s Wall Path explores this famous British site with a unique two-way National Trail Description. Hadrian’s Wall is the world’s finest surviving Roman frontier, running 85 miles from Wallend, near Newcastle, to Bowness-on-Solway, near Carlisle. With the opening of the Hadrian’s Wall national path trail in 2004, it is now possible to walk the entire length of the Wall on a designated footpath. The Trail passes many fascinating sites and the ghosts of the Roman Empire are very much in evidence through the various watchtowers and sections of walls that still exist. The guide is organized into 32 stages with each section described in both westbound and eastbound directions for ease of reference, allowing walkers the freedom to choose which way to walk. Each section is thematically titled to give a flavour of that part of the Wall and the guide is packed full of interesting historical and linguistical snippets to keep all walkers entertained and engaged. An extensive introduction includes information on the Building the Wall, its status as a World heritage site, tips on planning a Coast-to-Coast walk and advice on ‘Walking the Trail Piecemeal’. Detailed rout descriptions are accompanied by exquisitely detailed and intricate colour line diagrams mapping the route ahead and providing information on points of interest, in addition to colour photographs illustrating some of the highlights of the ancient Roman frontier.